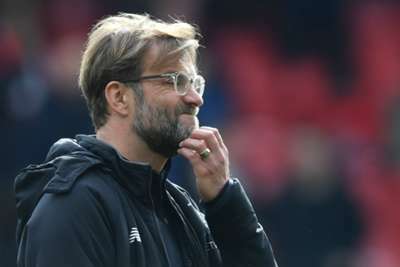 Jurgen Klopp says he does not mind being drawn against Manchester City in the quarter-finals of the Champions League, though he expects Liverpool to be the underdogs. The Reds will host the Premier League's runaway leaders at Anfield on April 4 before the return leg at the Etihad Stadium six days later. An all-Premier League tie will capture the imagination, with Liverpool the only team to have beaten City in the top flight this season. "I've said it before and it's still the truth," Klopp told Liverpool's website. "It's always common in a draw that you'll get your neighbour, more or less, but to be honest I don't mind, really. "It is exactly like it was before - we take what we've got. Now it's Manchester City, let's go. "We've lost once and we've won once against them in the league, and I don't think [beforehand] they thought the best draw they could have got is Liverpool. That's a sign for us and how strong we can be. "We are for sure not the favourites in this round, but in the last eight there are not a lot of favourites - maybe two of them, Bayern [Munich] and Barcelona – but thank God it's football and nothing is decided. "We have a few games to play until then, but I am really looking forward to it and we will give it everything." City arguably have an advantage having been given the second leg at home, but Klopp - whose six wins against Pep Guardiola are more than any other manager - denied playing at Anfield first is a negative for his side. "In this case, it's not too important. For us, it's completely normal," Klopp said. "We can get a result at home for sure, but it's obviously a difficult game – but good news for both teams. "It is like it should be in the last eight. It was clear we would face a strong team. Now we have Man City. The good thing is they are the team we know most about. It's not too cool for England because now only one team can go to the semis. But we will try everything. "We are already looking forward to [the first leg]. And it's a nice, short trip for our supporters when we go to City. I know our away fans are fantastic, so that will be a great atmosphere as well. They are two really good games and a big challenge for both sides – but that's like it should be."